The RF-1 suppresses subsonic energy to eliminate annoying and potentially harmful woofer pumping cause by low frequency rumble. It is also useful for suppressing acoustic feedback through your analog system. 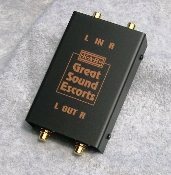 Connects between your phono stage and preamp and comes complete with wall wart power supply. Features high quality internal components and RFI/ EMI shielding. Please see our KAB Electro-Acoustic Product Information page for more information on this innovative product.